Due to concerns about blood-borne pathogens, there are clear guidelines for the disposal of sharps used in people. But what happens to all the used sharps used in agriculture? Where are they stored? Can they be thrown in the household trash? Are there general guidelines or recommendations for disposal? One of the early initiatives for UMASH was researching needlestick injuries in animal agriculture and “best practices” for prevention of needlestick injuries. It was reported that over 80% of farmers1 (Jennissen, Wallace et al. 2011.) have accidentally stuck themselves with a needle which prompted UMASH to develop educational materials related to needlestick prevention in agricultural settings. A recent UMASH review of veterinary sharps disposal documented the county level resources in both Minnesota and South Dakota. 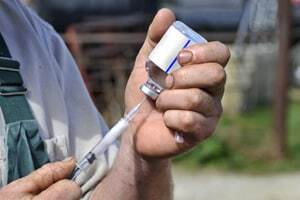 The Upper Midwest overall has a number of swine, dairy, beef operations who use sharps for vaccination and disease treatments. We observed that there were some variations in recommendations from state to state with respect to sharps disposal. With the large number of animals and vaccinations performed in the upper Midwest, proper sharps storage and disposal is important. 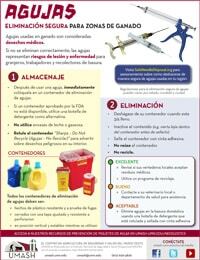 To help farmers and veterinarians, UMASH has developed a bilingual (English and Spanish) fact sheet to provide guidance on the proper disposal of veterinary sharps. The fact sheet addresses proper storage and disposal and encourages farmers to check with their local solid waste department for any additional guidelines. This and other needlestick prevention resources are available for FREE on the UMASH website. Share these safety resources with others! Download the FREE sharps disposal fact sheets below and add them to your training and safety resources.